Candace​ G. Wiley​ was born in S.C., graduated with her B.A. from Bowie State University, an H.B.C.U. in M.D., her M.A. from Clemson University, and her M.F.A. at the University of South Carolina as a James Dickey Fellow. She is co-founding director of The Watering Hole, a nonprofit that creates Harlem Renaissance-style spaces in the contemporary South, and she often writes in the mode of Afrofuturism, covering topics from black aliens, to mutants, to mermaids. 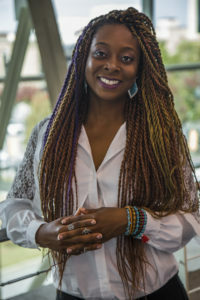 She is a Vermont Studio Center Fellow, Lighthouse Works Center Fellow, Fine Arts Work Center Fellow, Callaloo Fellow and former Fulbright Fellow to San Basilio de Palenque, Colombia, a town that was founded by West Africans who had escaped from Cartagena slavery. (The people have their own language and customs that trace back to the Bantu and Kikongo in West Africa.) She is currently complete the Tulsa Artist Fellowship and is now living, writing, and running The Watering Hole from Tulsa, O.K. “Parcel Map for the County Assessor” and “The Cut Up.” Black Girl Magic Anthology. Forthcoming. “Answers for the Hard Questions” and “How to Lift Him.” Texas Review. Fall 2017. “Breaking Ground as Poets of Color.” Free Black Space. January 2016. “Igbo Landing” and “Prayer for the Dead.” Chaparral Poetry Journal. October 2016. “Keri Goes to L.A.” Illuminations Magazine. June 2016. “How to Mutate” and “Lost Boys.” Jasper. January 2016. “Amulet.” African American Review. Winter 2015. “Dear Black Barbie.” Best American Poetry, 2015. “Post-Racial.” Free Black Space. April 2015. “Dear Black Barbie.” Prairie Schooner, Spring 2014, Vol. 88, No. 1. “Heirlooms.” Pluck, Fall 2012, No. 8. “Three-Flag State,” “Michael 1992.” Jasper. August 2012. “White Girl,” “Grandmother Clock,” “Single Mother’s Song.” Home is Where: an anthology of African American poets from the Carolinas. Oct. 2011. Silberblatt, Neil. “022618 Poet Corner Candace Wiley.” WOMR Podcasts. February 2018. Woods, Ann. “Candace Wiley brings People of Color Back to the Future.” The Provincetown Banner. February 2018. “In the Spotlight.” Association of Writers and Writing Programs. January 2018. Jones, I.S. “A Telling Erasure.” Chaparral Poetry Journal. October 2016. Bates, Margaret. “Sitting Down with the Women of The Watering Hole.” Legendary Women. Oct. 2015. Madden, Ed. “Jasper’s Artist to Watch.” Jasper. August 2012.